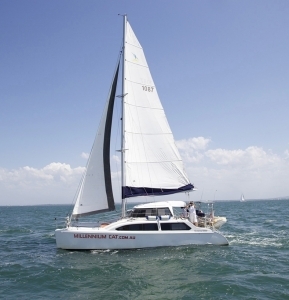 Millennium Cat is a Seawind 1000 Catamaran, Australia’s most popular sailing catamaran – very solid & comfortable – easy to sail. She has 2 x 20HP Honda engines, electric anchor winch, all the mod cons.Up to 10 people can share this fantastic bareboat experience – there are 4 double cabins plus the saloon table drops down to create a huge double bed – sheets, towels & pillows are provided – just bring your swimmers & beach towel.A fully equiped galley has a gas cooktop/griller, oven, fridge & freezer – all plates, cutlery, glasses – you bring your own food & drinks. The Bathroom has a flush toilet, vanity & hot/cold shower. 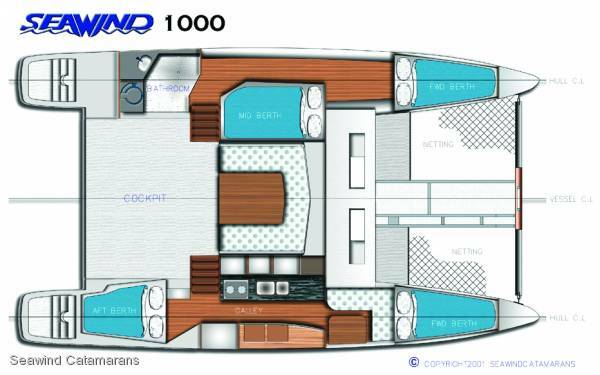 Large Saloon has seating for 10 people, & flows out to a large Deck area with a gas BBQ & more seating – huge esky too! All the mod cons – GPS Plotter Navigation, Auto pilot, wind & depth instruments, Dual Helms, VHF Radio, CD Stereo, HD LCD TV with DVD – excellent local Brisbane TV reception.